As someone who writes about games I’m always both fascinated by and apprehensive of the jump towards developing my own: I have a level of head knowledge about systems, stories and mechanics that work from a larger scale, but each time I try to translate these into a working set of systems, I hit a whole new set of challenges to overcome. Kadokawa Games’ long running RPG Maker series has always managed to tread the line perfectly between accessible interfaces and powerful customisability, allowing non-developers to turn out work that matches faithfully close to their original vision. 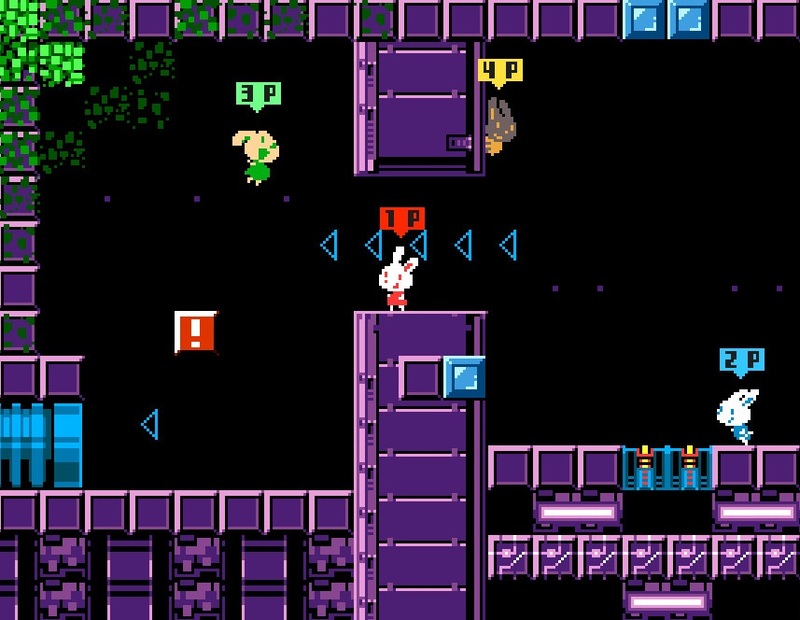 The ethos is still there in Pixel Game Maker MV, a sister platform that switches genres to action side-scrollers and top down Zelda-likes, but with the increase in complexity between turn based JRPGs and action games, the maker itself also becomes more complex as a result. I find that with every game creation tool there are three core desires: building levels within an already functioning set of systems, building a game from scratch using easily understandable interfaces, and tweaking with simple code and programming functions to achieve a result on par with the “professional” packages such as Unreal or Unity. Whereas the RPG Maker series is firmly about the first camp, Pixel Game Maker MV falls into the second. When starting a project, you can choose side-scroller mode or top-down mode, and from there, you also have an ominous little checkbox titled “create blank project”. If you don’t check it, your project comes pre-loaded as an already finished game, with tilesets, characters, enemies, levels and everything already made for you, ready to play. You’re free to jump into the editor and fiddle around with the little things. But if you do decide to dive into the blank project, you are greeted with nothing. One of the downsides to Early Access game creation tools is that there’s not a lot of documentation for usability, and it’s hard to know which features are in the current build, which features might one day be added to the package and which features users should try and implement themselves. New users would find their time best used either finding tutorials on YouTube or perusing through some of the game’s own menus to see what is possible. There is an online manual which tries to introduce users to Kadokawa’s not-always-intuitive systems, but the best way to learn is still to build, experiment and push buttons until you come up with something interesting. That being said, the lack of a developer tutorial (soon to be implemented) really hurts the current build, and players who jump in with zero game design experience may be easily overwhelmed. One of the more interesting aspects of Pixel Game Maker MV compared to other 2D engines such as Game Maker Studio is a strong graphics-focus which filters through the way users will design their games. 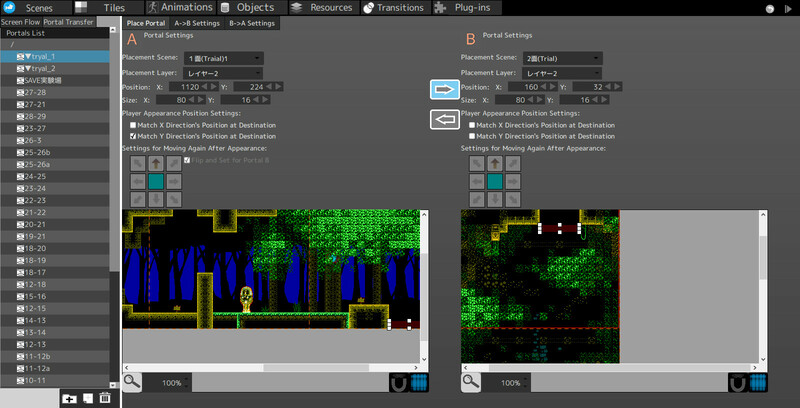 Players start by importing tilesets for everything they will use, setting these as Standard (eg. floors, walls, decoration) or Gimmick (eg. switches, traps). The latter are great for Mega Man style disappearing blocks, falling blocks or general interactive environments which in any other engine you would need to build individual objects and triggers for. Everything does need to snap neatly to a grid though – there’s unfortunately no support for the more artful, hi-fidelity pixel styles, but that doesn’t mean users can’t make something aesthetically pleasing within the game’s constraints. Objects are easily defined by their sprites and animations, and there is a behaviour tree system which allows easy implementation of both fluid transitions between animations and basic game AI. I was quite impressed by the amount of customisation afforded to both player characters and enemies, although with features comes added complexity. There is a particle animation system which is easy to use, but also harks back to doujin-soft style special effects that give the game a quaint feeling. There is even a basic physics package for complex object interactions. These are some of the most complex moving parts of the package, filled with numerous menus for fine tweaking each individual behaviour of your object. The action is broken up into “scenes”, as the game calls, allowing for a game of sizeable scope – this is a necessary addition as individual rooms can slow performance down if things get cluttered. The scene menu is a little difficult to navigate – it can get confusing to see how multiple rooms connect into each other in a zoomed-out view, for example, so it’s good to also keep your own hard copy notes of your game’s structure just so things don’t get lost if your project grows too big. 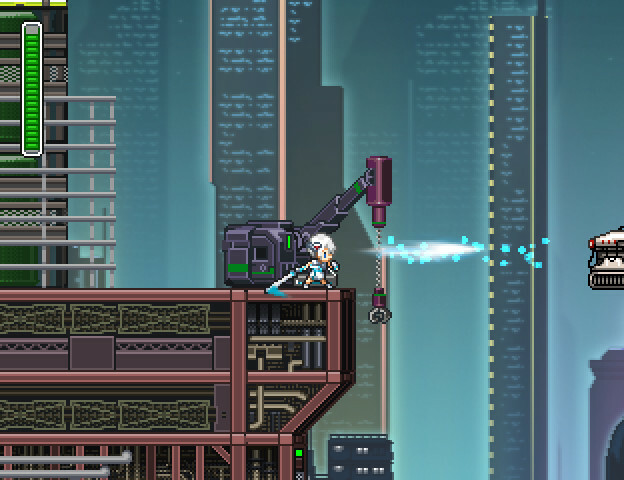 As for what is possible with the tools available, Pixel Game Maker MV is already in a great position to make a sidescrolling action-combat game or a top-down Shock Troopers style shooter. There’s still a little polish that the systems themselves need, and there are a few features that are sorely missing, but it’s entirely possible to output something creative, original and highly playable with the current build. The cost of entry is high, and it’s a commitment to peruse through all the available information to figure out exactly what this engine can do, but with time and as the community grows with expertise, these issues will be sure to lessen. For burgeoning game designers who see the restriction to pixel art as a boon instead of a limitation, Pixel Game Maker MV should be right up your alley.